The bit depth or color depth of an image represents the number of bits used to represent each color pixel. So the higher the bit depth, the better the resolution and the quality of the image. Controlling bit depth can make the difference between a grainy or fuzzy image and a clear one, in which colors resemble reality to a great extent. With reaConverter's latest edition you can choose to optimize the bit depth of an image when converting, or to preserve the same values from the input to the output image. For example, you can switch from a 4-bit rendering of an image, in which the combinations of the red, green and blue can support a maximum of 16 colors, to an 8-bit format, in which the number of supported colors increases to 256. Load one or more images you intend to convert. 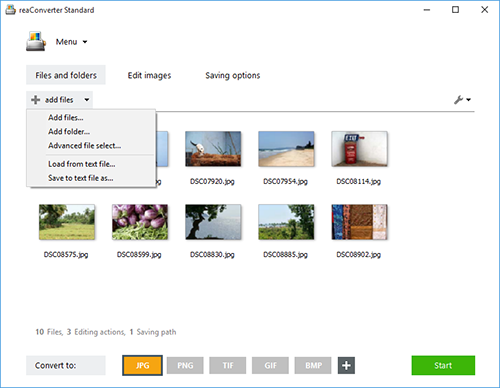 Add them one by one, add entire folders or use the handy drag-and-drop tool. In the Color tab you will be able to decide the bit depth of the output image. 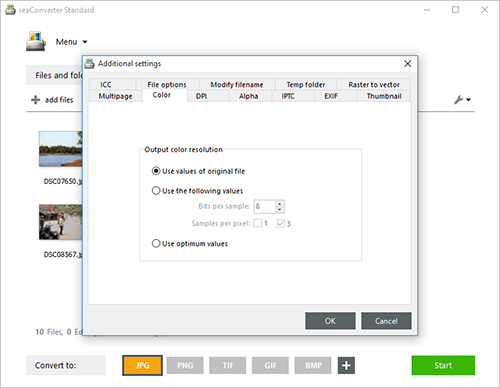 Available options include using the values of the original file, using customized bit per pixel values, or letting reaConverter decide the optimum bit depth value for your images. In case you want to apply additional image editing, such as resizing, auto rotating or auto croping the image, go to the Edit images tab. If not, go directly to Saving options and pick a location for your output images. reaConverter allows you to save them online or offline and includes all sorts of handy features, such as the possibility to save directly in your Google Drive or in a subfolder of the source folder. 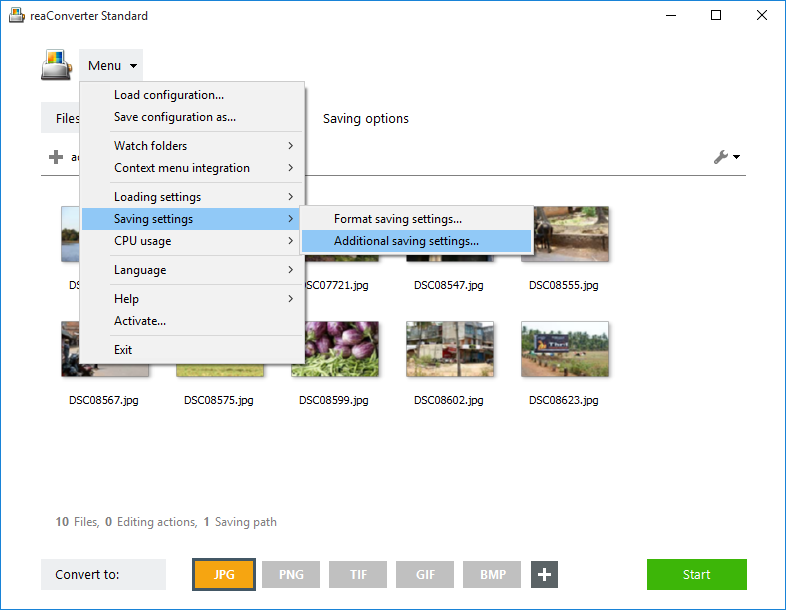 Finally, pick the output format of the image files by clicking one of the buttons in the lower part of the screen, and push the Start button to complete the conversion.